Last week, while perusing Instagram, my daughter asked if I had ever made carrot cake. Well, sure a long time ago B.C. (before Celiac’s) I did. Back then I could bake just about anything with success, regular flour is… predictable. Gluten free, well not so much. I love carrot cake, it’s a great way to hide vegetables in baked goods. 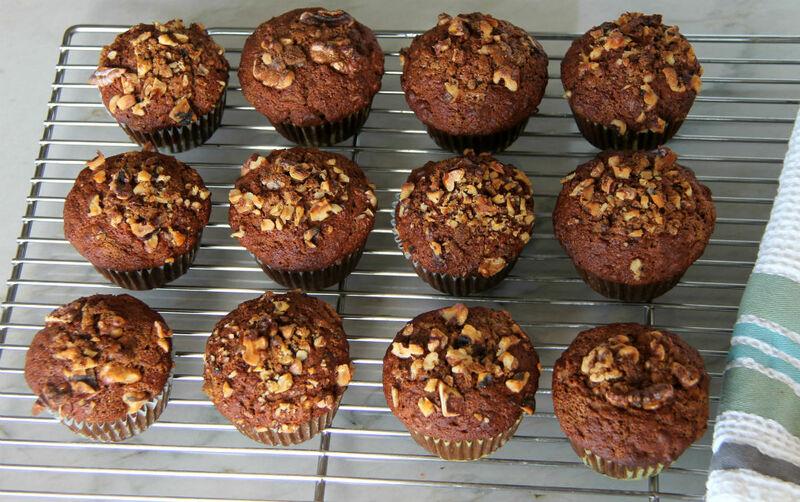 Also, I do have a habit of freezing my baked creations, and muffins seemed to be easier to freeze per serving. I would have had to pre-slice the cake in order to freeze it, no thank you. These are not just your average muffins either, they strike a nice balance between mandatory breakfast item and grab anytime of day kind of muffin. Further perfected with a nice crispy, slightly sweet and crunchy top, arguably the best part! Jammed packed with grated carrots and apple clearly ticks the box for healthly, and just enough spice to make them interesting. Looking forward to breakfast tomorrow…. Prepare flax egg if using. Preheat oven to 375 degrees, prepare muffin tin with liners or lightly grease them, set aside. To flax egg or regular eggs add mashed banana agave or maple syrup, olive oil and whisk to combine. Add brown sugar, baking soda, salt, cinnamon and almond milk stir to combine. Fold in the grated carrot and apple, oats, almond meal and gluten free flour and stir to combine. Divide evenly among 12 muffin tins, I used a medium ice cream scoop, filling them to top. Sprinkle with brown sugar and crushed walnuts. Bake for 30-35 mins or until deep golden brown and a toothpick inserted into the center comes out clean. Remove from oven and let sit for 5 minutes, flip over onto their side and let cool completely or remove to wire rack. If you prefer to bake a loaf use a 8 x 8 pan and bake for approx. 45 minutes.